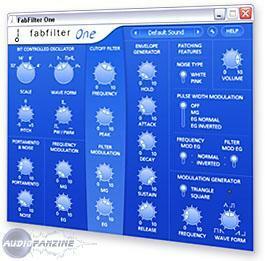 One, Virtual subtractive synth from FabFilter. 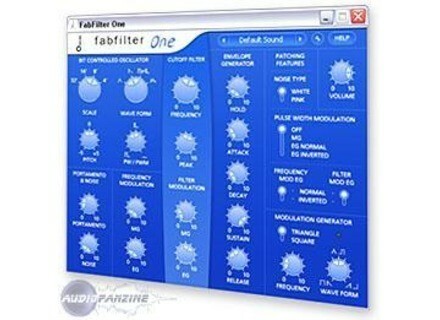 FabFilter's One is a basic, but highly effective software synthesizer. I've only had the chance to mess around with this soft synth as I've only really scratched the surface with it as of yet. I don't own it, which I why I haven't used it all that much yet, and is also why I wasn't involved with installation. This is FabFilter's simplest synth, as their ideas are expanded in their other virtual synths. The interface has just one oscillator, but a serious amount of further control for messing with the sound of this oscillator. It's got sections for a cutoff filter and envelope generator, along with a variety of further parameters for modulation and other purposes. It doesn't have anything out of the ordinary when it comes to a synth, but also isn't really leaving anything out. It's got a really plain and basic interface to control everything, making it as simple as possible to control this synth. If you're new to synths it might be a good idea to have the manual, but certainly not necessary considering that this is a very basic soft synth. A producer who I work with has the FabFilter One soft synth on his home studio's system. He's got pretty much all of what FabFilter has to offer, most of them being effects and signal processing plug-ins rather than synths. I don't know all of the specs of his machine off the top of my head, but it's Pro Tools HD based which really says enough about the stability of the system. Again, this is a simple synth anyway so it doesn't take up too much processing power to begin with. While it's not writing software synthesizer history, the FabFilter One virtual synth is a very solid, yet very simple one. FabFilter has more in depth synths for those who are looking for something a bit more complex, but for those who just want a cheap and simple soft synth, One is for you. It has a great overall sound that is highly manipulable with the wide range of parameters offered, although there's only so far you can take it with one oscillator. This is the perfect place to start if you're looking to get your feet wet with soft synths, but is definitely useful for more experienced users as well. It's cheap enough where this one is absolutely worth checking out for yourself! So far I have had no compatibility issues but I did have one problem. When I first started it up, I had to locate the presets folder. Once found, it worked fine. The manual is clear enough. There isn't much to this synth as it is pretty simple so there wasn't much to read up on. Yes, the configuration is a simple as it gets. You get a set of knobs (4x4) and a few other options. Very easy to figure out. All the typical functions are very easily accessible. So far the FabFilter One works great in both Logic 9 and Ableton 8. I have not had any issues with crashes or lost presets. I had an issue setting up one of the midi cc buttons but it turned out to be my own stupidity. Just to let everyone know, the sustain pedal on your keyboard won't hold the notes out by default. You have to set it manually via the "Midi Learn" feature and set it to the "Hold" knob. I have been using this synth for only a few weeks. What I like most about this synth is its overall simplicity. It is very easily navigated and by starting with the presets, you can really get some great sounds out of this thing. I personally like the pads and the drum synth sounds. The only thing I don't like about this synth is that the sustain pedal isn't setup by default to hold notes. Other than that, no other problems. My studio partner bought this one a few years ago but he didn't remember how much. The sound quality is really good. Its very warm and realistic. I have used many plugin synths and this one is a pretty good contender. I don't use it much for recording as much as I do live. It very easy to use so its ideal for quick editing during live situations. Yes, I would definitely buy this one if my studio partner hadn't already.